What's New At Oak View? Ginger has a fantastic temperament, and received her TT (Temperament Test done by the ATTS) certification at 18 months of age. She is a daughter of Bina and Ubuntu, and we had high hopes for her in our breeding program. Unfortunately, Ginger loves to chew on anything and everything - and she had to have complicated intestinal surgery to remove a tug rope that she had swallowed, knots and all! Ginger did have one litter, and then we placed her in a family home in Illinois to enjoy the rest of her days as a beloved pet. We did not want to put her through the complications related to pregnancy and whelping, as it would certainly be more difficult and dangerous for her each time. 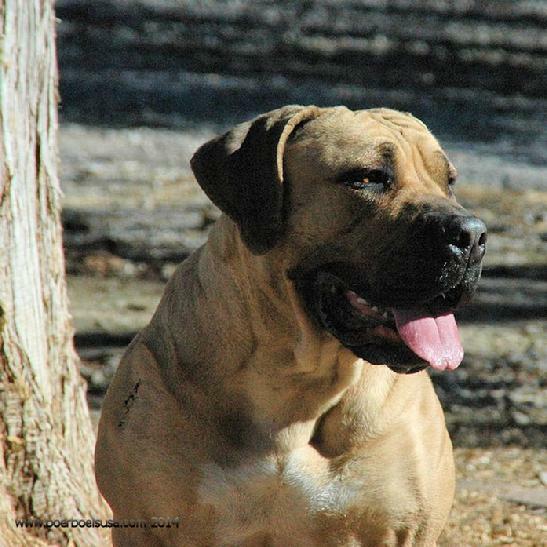 It was a difficult decision, because we love her personality and she is a special boerboel. OVK Boerboel is located in Fulton, Missouri. © 2001-2019 Oak View Kennel. No content may be used or reproduced without expressed written consent from Oak View Kennel.